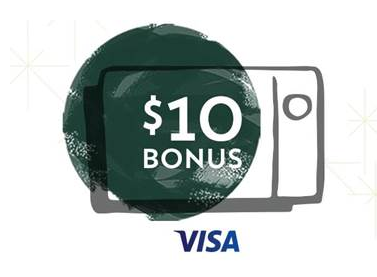 Buy a $10 Starbucks Gift Card Get $10 Added FREE for First 100,000 VISA Cardholders! Here’s a great deal from Starbucks! Be one of the first 100,000 to buy a Starbucks Card eGift of $10 or more with your Visa® card from Dec 8 – 12 and we’ll add an extra $10— just a little bonus to make your gift go further. The bonus won’t be reflected in your checkout experience, but will be confirmed in your email receipt. One per person. Cannot send to yourself. This offer is still available.